Celebrate Halloween with music and fun during one of Singing with Sylvia's Halloween Howl concerts. Sylvia's 45-minute concerts feature interactive songs, action rhymes and quirky characters to engage children ages 2 to 6. Children and their adults are encouraged to wear their Halloween costumes. 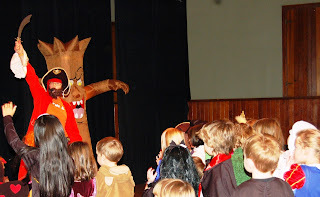 Click here for for a review and pictures from one of Sylvia's past Halloween Howl concerts. Tickets are $7 in advance and $9 at the door. Children under 2 are free. Special rates are available for schools, preschools and daycares. Contact The Refinery Box Office, 653-5191, or order online. Earn a chance at two tickets to the show by sharing a fall picture of your kiddos through your Instagram, Facebook or Twitter and tagging us @saskmomdotcom and including our hashtag: #imasaskmom. (One entry can be made per social medium, so if you post on all three, you can be entered three times.) A winner will be selected on October 22. @SewUndomestic‎ on Twitter is our lucky winner!